Editor’s Note: Markets will be closed tomorrow in observation of Good Friday. FUELSNews will resume publication on Monday. Crude fell by just short of a dollar yesterday, propelled by EIA data that left much to be desired from fuel demand. Crude oil plummeted below $64 before recovering, bringing the trade to $64.38 by the end of the trading session. 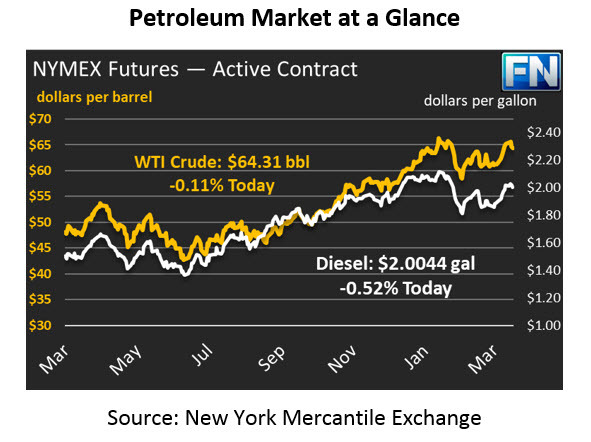 Today, crude oil prices are $64.31, virtually unchanged from their position yesterday. After remaining above $2/gal for over a week, both gasoline and diesel prices are testing lower territories, with prices both yesterday and today dipping below the $2 level for brief periods. Today, gasoline prices are trading flat with yesterday’s close, with prices at $2.0066. Diesel prices are down a penny, and just a few points below gasoline, trading at $2.0044. The EIA’s inventory data was less exciting than the API had led markets to believe. The API reported large crude builds and larger fuel draws, but the EIA’s official data showed just a small crude build and meager draws. A small build in Cushing, OK also caused oil traders to pause, since it signals a reversal from the steep destocking pattern seen in early 2018. Yesterday the Dallas Fed releases their survey of oil drillers, showing that the average breakeven price for oil production across the U.S. is roughly $52, above 2017’s $50 average. Rising production has created more demand for fracking sand and water at drilling sites, as well as more demand for crews and transport drivers. This increase in demand has driven prices up. Still, with crude well above $60/bbl, 88% of respondents said they can profitably produce oil at current prices. Over half of the oil companies polled say they expect to hire even more people in 2018 than last year, which bodes well for continued production increases and lower oil prices.